Hubby and I went out for brunch at the Blue Star Café in Wallingford. I love their hearty meals, and especially that they can veganize any of them. 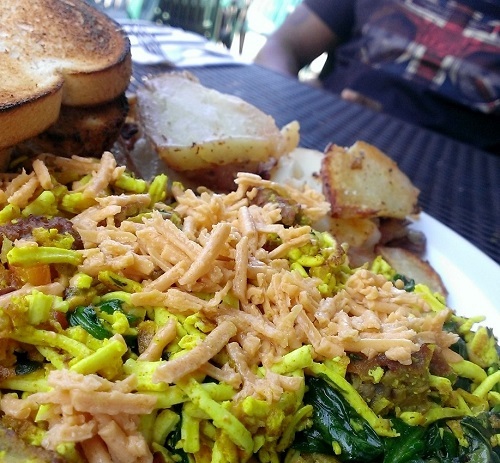 I had a tofu scramble with non-dairy “cheese” and toast and home fries. Delicious! And of course a mimosa is a brunch must-have. 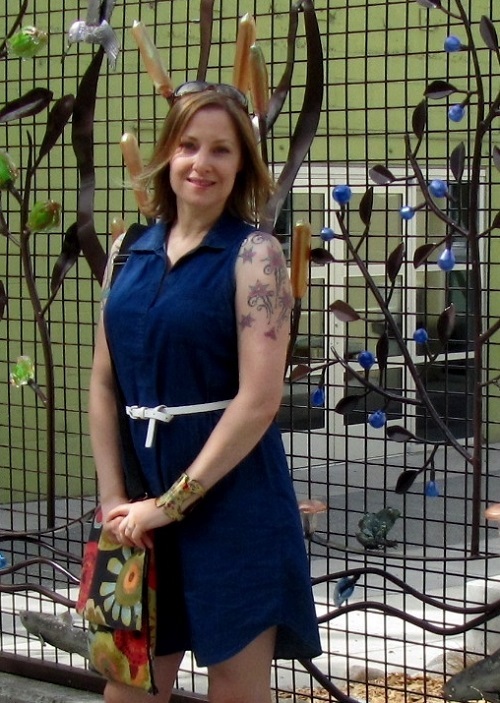 I wore a denim dress that I picked up recently. 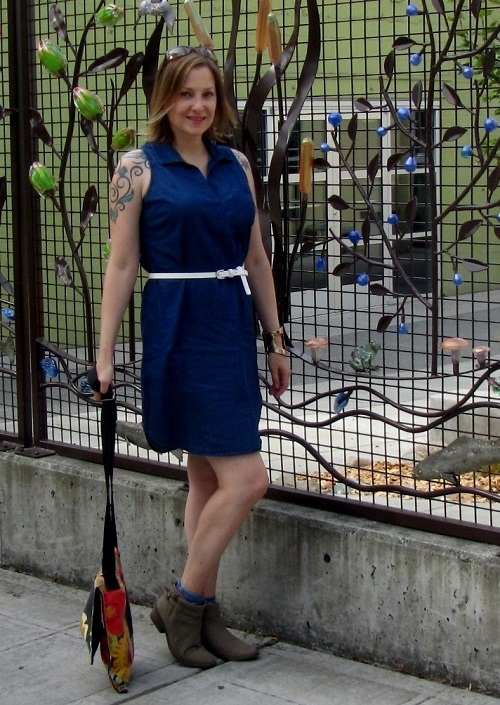 It’s a simple shirtdress style that I can cinch with a belt. Today I chose a skinny white one but it would be fun with a wide belt or sash too. I’ll try this in the cooler weather with tights. 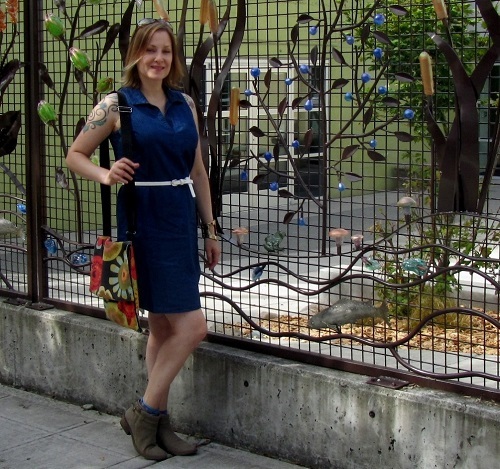 I love going sockless in the warm weather–sandals are a favorite–but I find boots take a summer dress into fall even before the weather is cool. It’s still relatively nice out but sandals are starting to seem less appropriate. Swapping in a bootie grounds the outfit and is a nice fall transition. These booties proved to be invaluable on this occasion. After brunch, I got an invitation to meet up with friends. So hubby took my car and ran errands and I walked to the University District. I have to say, these boots are made for walking! I’m also incorporating some of recent finds from my New York trip. The bag, from a flea market, is made of upcycled upholstery fabric. My cuff is from a great store on 125th called B.O.R.N (borrowed, old, refurbished, new). I’ll write about all the wonderful things I found at that store real soon! I’ve joined Monday Bloom and Style Elixir for linkups – have a look at what everyone else is wearing! Hello, Jean. So cute, this little dress with boots. Transitional indeed! I can imagine you wearing these same items with more layers later on … will be just as effortlessly adorbs. Always pretty! Thanks for your kind comment! I will definitely be layering (starting today the weather is feeling fall-like). I like to get more mileage out of my clothes, whenever possible! What a cute dress and it looks great with the booties–a perfect late summer outfit that will make a nice transition into fall (as you say). It will also look great with tights and a wider belt. Oh please go! I got this after NYC (even though I told myself I’d take a shopping break) so they’re probably still in the stores. Thanks for commenting!